Huawei launches P30 and P30 Pro smartphones with OLED displays | What Hi-Fi? Huawei has just unveiled its P30 series of smartphones, including the P30 and P30 Pro, at its launch event in Paris. Though heavily teased and with a fair few leaks before the announcement, including by Huawei itself, full details are now available – a Leica quad camera, innovative alternative to the RGGB Bayer filter and some quite astounding zoom capabilities being among the headlines. In short, the Chinese manufacturer has set about making the P30 Pro, which operates on the company’s Kirin 980 chipset, the best smartphone available for taking photos and video. The handset is kitted out with Huawei’s 40MP Superspectrum lens, a 20MP ultra wide angle lens, an 8MP periscope zoom lens with 5x optical zoom, a Time of Flight lens depth of field, and a 32MP front camera for selfies. That 5x optical zoom is extended by a hybrid zoom capable of magnifying by 30x, and up to 50x using the digital zoom; macro photos can also be taken from a minimum distance of 2.5cm. The standard P30 handset's three cameras are capable of 3x, 5x and 30x zoom respectively. Aiming for more than greater detail, however, Huawei has followed its mantra of “willingness to change and innovate” by scrapping the RGGB Bayer filter and introducing yellow to its pallet instead of green. Being lighter, yellow allows for greater brightness and command of darker scenes. 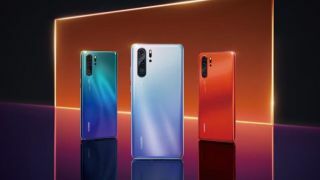 As such, the ISO, which denotes light intensity, is up from 102,400 in the P20 Pro – which already matched certain DSLR cameras – to 409,600 in the P30 Pro, making it the highest-ever light intensity achievable by a smartphone. Video, meanwhile, is taken in 4K at 30 frames-per-second, while Huawei also promises better stabilisation and the effects felt from that upturn in low-light capturing. Though you’ll likely want to take your images and videos from the phone to witness its full glory – there are no 4K screens on offer here – you will have a decent amount of screen to view them on: the P30 Pro features a 6.47-inch curved OLED screen, while the P30 offers a slightly more modest 6.1 inches of OLED. Camera quality is certainly the focus with the P30 series, but fans of 3.5mm aux connections will rejoice at finding one on the regular version, though the P30 Pro has only USB Type-C for those uninterested in utilising the aptX HD Bluetooth. Either way you should be able to get through your morning commute and then some: the P30 Pro has a 4200mAh battery, which Huawei claims will facilitate two whole days of basic use, reduced by half for intensive usage. Super charge will also take you from flat to 70% in only 30 minutes, while wireless quick charge and reverse charge serve those for whom cables are a thing of the past. Because the back matters to many as much as what’s on the screen, Huawei is offering five colour finishes. Alongside your basic Black, there is also a Pearl White, Breathing Crystal (a kind of light blue), Amber Sunrise (orange) and Aurora (a bluey-green based on the Northern Lights). The P30 is available for €799 in a 6GB/128GB version, while the P30 Pro can be bought from €999 in 8GB/128GB, 256GB and 512GB options – so no excuses for not filling them up with photos. The P20 series accounted for 80% of Huawei’s 20 million handset sales in 2018, so hopes will be high the P30 series can do something similar. You can read about our first impressions in our hands-on review.